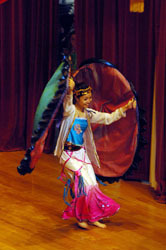 Join Kita Performing Arts Company to experience the lively magic of Asian cultural celebrations. 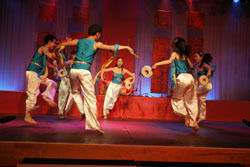 ‘Celebrations’ features a techno- version of the Indonesian plate dance ‘Tari Piring’, ‘So Go Book Chum’, a drum dance from the Korean Farmers Harvest Festival of Korea, ‘Monsoon’, a Bollywood-style celebration dance from India, the ‘Legend of the Moon Lady’ from the Chinese Full Moon Festival and a rambunctious Lion Dance from ‘Tet Trung Tho’, the Vietnamese Harvest and Children’s Festival. 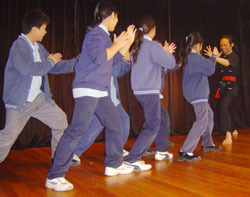 The show incorporates dance, martial arts, drumming and song to enthral primary students as they learn about the movements, styles, stories and celebrations of different Asian cultures. 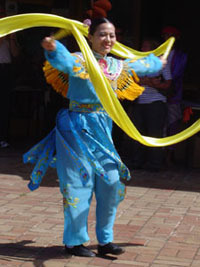 ‘Celebrations’ includes many opportunities for participation. Students might be invited to join the dancers play Korean hand drums, sing like Indian villagers, act the part of one of the Ten Burning Suns or create the Parade of the Lion. Tricky Tales is a highly interactive show for children that includes elements of traditional Asian culture, including dance, music, stories and song, presented in a light hearted and entertaining way. The performance will be based around three traditional stories in which the tables are turned on an unsuspecting creature. The Rabbit’s Heart from Korea, The Farmer and the Monkeys in the Forest from China and The Adventures of Mouse Deer from Indonesia. The stories are woven together into a performance with jokes and humour from various Asian cultures. Audiences have opportunities to participate, both from their seats and with selected children being invited on-stage to take various roles. From Kung Fu and Tai Chi to Tae Kwon Dance and Hip Hop Funk, this show introduces Asian culture past and present through martials arts and dance. Kita's highly skilled dancers present a window into the performing arts of China, Korea and Indonesia with a very participatory show that introduces weapons such as swords, flags and fans of the past, and snappy footwork and fast pace of present day Asia. 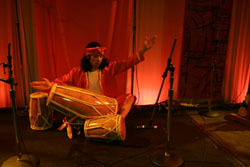 Martial Funk is an ideal complement to Studies of Asia, Peforming Arts, LOTE and English programs. The show includes many opportunities for participation. 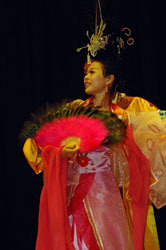 The dances from China, Korea and Indonesia are woven together by stories about life in Asia past and present. Audiences will enjoy participating in dance and storytelling with our performers. 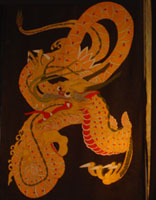 Myths and Monsters is an ideal complement to Studies of Asia, Peforming Arts, LOTE and English programs. 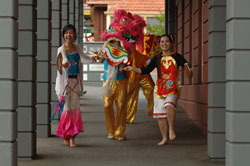 A window into the vibrant cultures of Asia through the performing arts, featuring traditional stories about the moon. 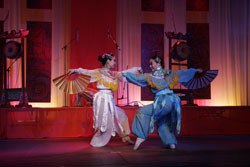 Highlights include the Chinese dance-drama of 'The Moon Lady', the Korean festival celebration, 'Welcoming the Full Moon', the elegant 'Peacock Dance' from Indonesia and the quaint Chinese love story of the 'Little Cowherd'. Kita's superb costumes, highly skilled performers and enchanting stories make 'Tales', a wonderful adjunct to studies of Asia and performing arts. The show includes many opportunities for participation. Students might learn the movements of the (Korean) rabbits in the moon making ricecakes, shoot down the (Chinese) Ten Burning Suns or try their favourite (Indonesian) White Monkey movements. This program includes dances performed for a variety of traditional functions, including harvest celebrations and preparation for war. The dances are linked by traditional cultural stories and anecdotes with the focus particularly on Korea, Indonesia and China. 'Journey's appeal is enhanced by Kita's collection of stunning traditional costumes, musical instruments and props. Highlights of Indonesian culture that can include dance, martial arts, music, stories and song. We can tailor a performance suitable for your group and budget. Sabilulungan, (Co-operation or One Voice), a traditional Javanese style rice-harvesting celebration dance. All our performances are highly interactive - including opportunities for students to perform on stage with us, or to learn some of our repertoire in their places. 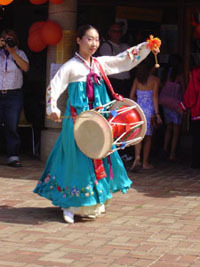 Highlights of Korean culture that can include dance, martial arts, music, stories and song. We can tailor a performance suitable for your group and budget. 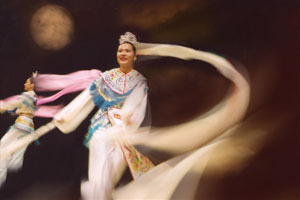 Highlights of Chinese culture that can include dance, drama, martial arts, music, stories, opera and song. We can also tailor a performance suitable for your group and budget. We are happy to discuss requests for special programs to suit your event or budget.